Whenever you go to a wedding, what catches your eye first? Is it the brides dress, the beautiful flowers, or the wedding backdrop? 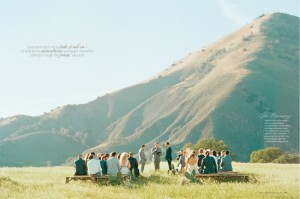 A favorite aspect of planning a wedding ceremony is the wedding backdrop. It does not have to be expensive, and if you are handy and creative, it can be very rewarding to create your own. You can steal an idea from someone or use your creativity for a one-of-a-kind backdrop. Consider your theme and your preferences. 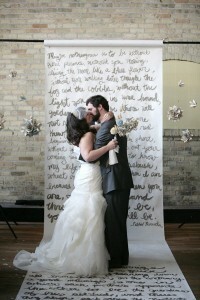 Wedding backdrops can range from whimsical to a fairytale setting. 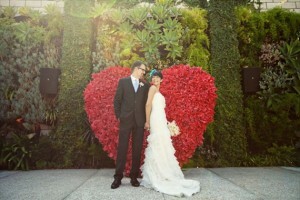 What better way to celebrate your love for each other than using a large heart as your backdrop? You can decorate the heart with real or paper flowers, or you can have your names inscribed on the heart with a lovely poem or phrase. The heart doesn’t have to be red. It can be pink or white or polka-dots if that is what you like. A frilly white backdrop is perfect for indoor or outdoor ceremony. Use sheets of white linen or gauze and drape them around and over your backdrop. Add in some white flowers or balloons to make it even more elegant. You can also add white twinkling lights for an evening or nighttime event. The written paper scroll is much more than a backdrop. 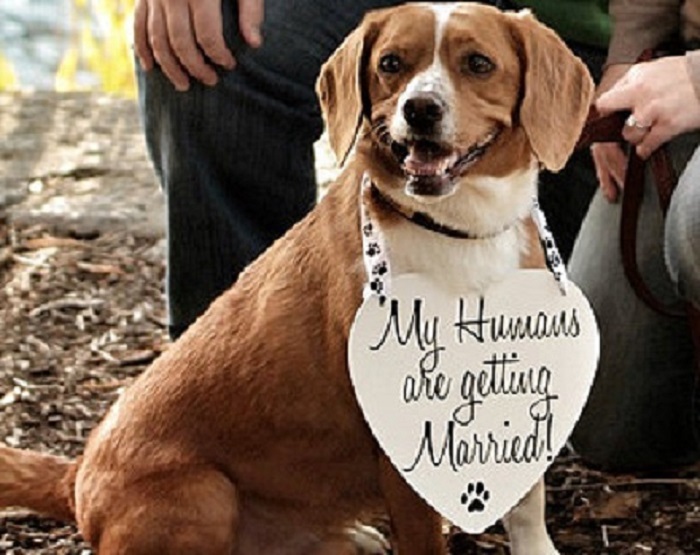 It can also become your aisle runner also. 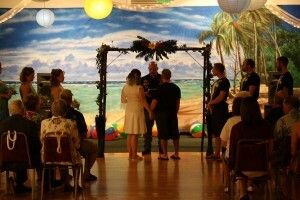 The key to this backdrop is to purchase a high quality scroll that can be hung in the front of the event area. Choose what you would like to write on the scroll. Perhaps you want to write some of your favorite poems or phrases. You can also choose to write in the lyrics to “your” song or words that mean something to both of you. The writing may be in any color, but it should stand out and be seen from far away. If you are getting married outdoors in a warmer climate, then use the surrounding trees as your backdrop. 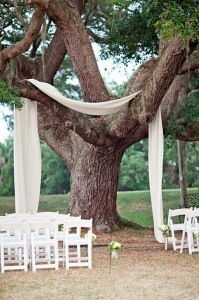 Choose some fabric in the colors of your ceremony and drape the fabric in the tree limbs. Don’t drape a lot of fabric, but just enough to make it look elegant and classy. Remember, in this instance less is more. Lights and flowers can be combined into a gorgeous backdrop. Choose complementary greenery or flowers to match your ceremony décor. Add in some white twinkling lights by intertwining them in the greenery. 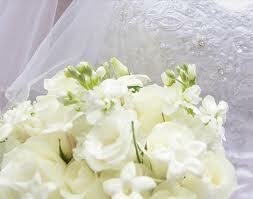 Flowers can be placed in glass vases or jars wrapped in twinkling lights. 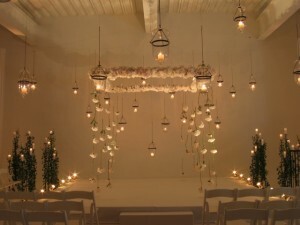 You can also drape lights on any stationary backdrop that may also be in the event space. If you long to have a beach wedding, but cannot afford the destination price, then use a beach scene as your backdrop. You can enlarge a beach picture to form a panoramic view of the coastline. Add in some sand and seashells, dress the part, and you have a very affordable “beach” wedding without the price and destination. What better way to create a backdrop than using what Mother Nature has made. If you like to hike in the mountains or walk in the park, there are a lot of choices when it comes to outdoor backdrops. You can use a mountain as the backdrop. No other decoration would be required for this. If you enjoy walking in the park and there is a lovely bridge overlooking a lake or stream, then consider getting married in that area. 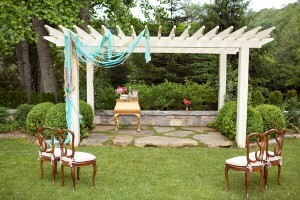 Consider getting married in an area with unusual décor such as an Asian garden or abstract art gallery. A pagoda can be decorated with fabric drapery and lights to make it very romantic while maintaining its mystery. 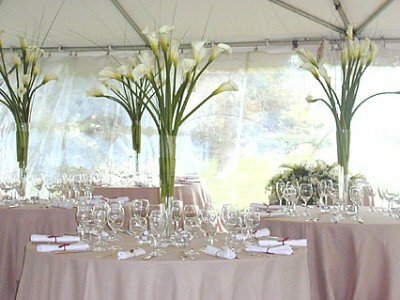 Decorate the outside if you are having an outdoor wedding. 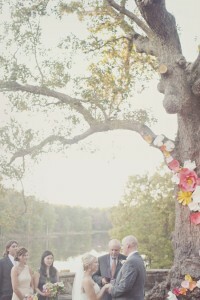 Add paper flowers to the trees in the vicinity of your ceremony. Bows and lights are great to string from the branches. Don’t add too much however, and stick to the same theme of either paper flowers or lights or whatever you are using. Take the phrase “something blue” and literally translate it into a beautiful blue backdrop. 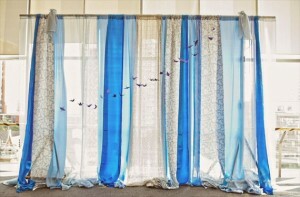 Using a long curtain rod, you can hang panels of blue fabric. Alternate between fabrics with sheer being the main type of fabric used. Consider adding interest with other elements such as metallic thread. These are all really great ideas. I like the simple tree with the draping. It’s easy, affordable and can be done is almost any environment (well that has trees). Thanks for sharing!